Today I’d like to put to rest the false and unhelpful notion that we “don’t have enough time” to make the regular efforts that are necessary to provide persistent input in the minority language and promote strong bilingual development in our kids. No matter how busy you claim to be, you can always give more time to your children—even if just a little more time—by making this aim a higher priority in your life. And the only exception to this, I think, would be if you’re reading these words from a maximum security prison and thus have no choice in the matter. Because that’s the thing: It’s about choice. It’s about consciously choosing how you spend the hours of your day. And let me emphasize that the building blocks of success—the time and effort we invest in nurturing the target language—are particularly needed early on in the journey, during the child’s first few formative years. It’s certainly possible to make up ground at an older age, but the whole experience can be a smoother success when a sincere commitment of time and effort is made from the very start. Of course, an au pair or nanny who speaks the minority language is another viable option for language exposure, but let’s focus, firstly, on optimizing our own efforts: Beyond the language input we can provide, the greater amount of time we spend with our children will surely deepen the parent-child bond, enabling us to create even closer relationships with our kids. Let me offer a concrete and encouraging example. Deepti Gupta (DeeptiGupta.com) is a busy actress who lives in the United States and has pursued an international career in film and theatre that stretches from the U.S. to India, Singapore, and Pakistan. At the same time, she juggles work off the set and stage as an actress for voiceovers and audiobooks and as a consultant and educator. Meanwhile, Deepti is a mother with a preschool son and a minority language, Hindi, that she wants her child to speak in addition to English. Despite her busy days, Deepti has also been mindful of her vital role in the process of handing down Hindi to her son. And this is clearly seen in the short-term project she pursued, with his help, to create a set of “alphabet blocks” in Hindi. 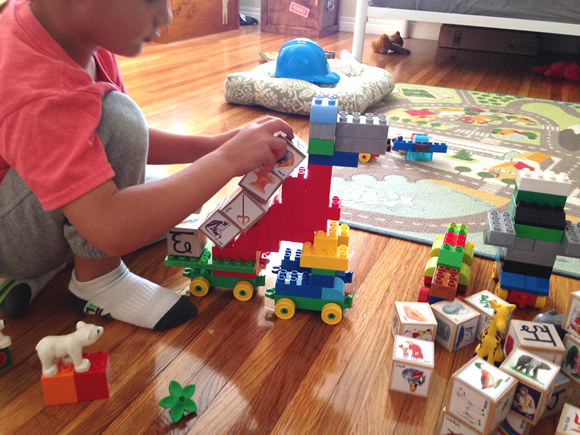 At first, I was only planning to make the blocks myself and give them to him to play with. But when I started working on them, and he showed interest, it struck me that this could be a parent-and-child project. So we worked on the blocks, little by little, making four or five at a time, over many months. Hindi has a lot more letters than English so it took time! Did you ever feel like giving up? How did you persist? But when I had those thoughts, I just moved on to something else that needed doing, and on a day I felt more relaxed and positive again, I’d say to my son, “Let’s make more Hindi blocks!” His own excitement about making them helped me feel that the project was worth it, no matter the negative thoughts. How did your son help? And how did you use the minority language with him at these times? We made the blocks by cutting out paper squares with pictures and letters on them and pasting them on the sides of the wood. Sometimes my son tried cutting them out, and though his squares were ragged, he enjoyed it. But he mostly pasted them on the blocks. He loved that. I’d ask him to look at the pictures and we would talk about the pictures and the letters. Or we would just chat while working on them. Slowly, he started to recognize the letters. 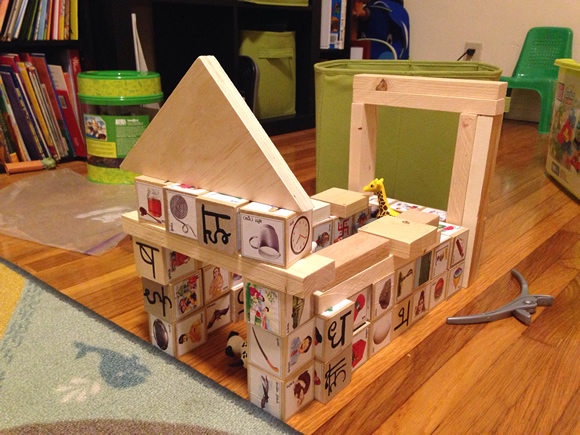 Now I want to continue engaging him with the blocks and using them as a playful way to teach him more Hindi. Did this project teach you anything about raising bilingual children? It taught me that opportunities abound for doing fun things with your kids in your language, and getting them excited about it. But it does require time and energy and creativity. These days, with work and other commitments, it’s hard to find the time. This morning, though, I played “I spy with my little eye” when we were in the car on the way to school—a Hindi version, of course. So there are opportunities if we look for them. A positive mindset, and making the effort to engage your kids is the key. A few days ago we had a visitor and this person went into my son’s room and saw the blocks on the floor. My son then proudly said that he made those blocks with his mother. That, to me, is a great reward. What rewards are waiting for you if you spend a bit of extra time and effort on daily routines like reading aloud or short-term projects like Deepti’s blocks? How about you? How can you increase the time you give to your kids? What additional efforts will you make to promote exposure in the target language? Really inspiring. This has been on my own ‘to do list’ for 6 months now because I too was getting annoyed that English alphabet opportunities are everywhere and I can’t find any Panjabi versions. So I was going to stick handwritten letters on the back of the English letters but the pictures won’t match….I’m going to have another think and also enlist help from my 3 year old because that makes it all the better. Thank you both. Arvind, I’m glad this post offered some inspiration to you. Best of luck with your Panjabi blocks and your whole bilingual journey! Glad you found this inspiring, Arvind. I got an alphabet chart booklet from India which is basically meant for cutting and pasting. You can find it at any stationary shop in any city in India. All the best. Awesome effort there by Deepti and thanks for sharing Adam! I had always had this idea but the minute I realise there are 248 letters in the Tamil language, I get overwhelmed and drop the plan!!! But great to see the efforts put in by Deepti! My son is 11 months now and we have been speaking to him in Tamil at home. I might also hold off preparing these blocks till he is a bit older, when he can also take part in the activity. Maybe I might get started with collecting pictures corresponding to each letter. Yes, Anu, if you can commit to working on this project bit by bit—starting with the pictures, as you suggested—by the time your son is a little older and can help with the work, you’ll be ready to go! And when your blocks are finally finished, please share some photos with me! Thank you, Anu. 248? Wow! That is indeed a lot. I had no idea. Starting collecting pictures is a great idea and, who knows, you might come up with your own project idea once you have them. Maybe not blocks, but something else!! All the best. Love this post, Adam! I believe that having a really good relationship and a close bond with one’s kids is a fundamental, if not THE most important, aspect of bilingual upbringing. And this can only be achieved by spending quality time together and fully giving oneself to them. Keep up the good work! Jana, thanks! I completely agree, and couldn’t have said it better! So glad you enjoyed the post, Jana. I learnt a lot from my son during this process and that I couldn’t even have planned for. He showed me how he wanted to engage with Hindi. I just had to give him an opportunity. Thank you and all the best. These are great!! 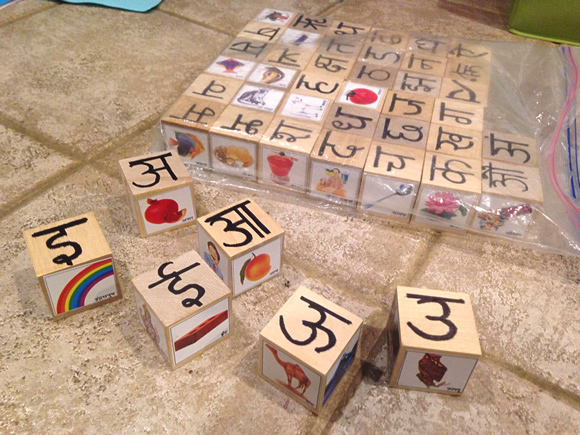 We stock Hindi wooden blocks but have been looking for them in other South Asian languages, and so hard to find!